Winter is the season of joy for those who have been waiting to dig out their favorite cardigans and jackets. For some it could be a mental battle trying to get out of those soft warm blankets and cozy beds. Nevertheless, everyone looks forward to hearty, body-warming and spirit-lifting food. Winter is the peak season for carrots. You might be no stranger to the fact that these orange veggies are great for improving eyesight. But dig deeper, you will be glad to know carrots are also loaded with powerful antioxidants like beta-carotene that lowers the risk of developing cancer. There are delicious ways you can enjoy them: juice them for a rich smoothie, puree them into soup or stew, simmer them with some milk and sugar for a delicious ‘halwa’ (dense dessert). Or when in doubt, simply cut them into thin sticks to have them as a snack. The nature’s jewels. Apart from being heart-friendly, pomegranates help slow down the ageing process by fighting against the free radicals. These ruby-red seeds can be tricky to retrieve but the benefits are well worth the effort! The right balance of sweetness and tart, make them perfect for fruit salads. Blend them into juice, spice it up with some pepper and salt for a snack with a twist and crunch. ‘Tis the season to go nuts over nuts! Dates, almonds, pistachios, raisins, cashews, peanuts, walnuts, hazelnuts to name just a few. They contain unsaturated fatty acids which help in lowering bad cholesterol. It is best to have them in balanced amount, ideally a handful of the mix per day. Although, each type of nut has different nutrition composition, most are rich in omega-3 fatty acids which contribute to keeping heart healthy. And since they are hot in nature, they also help you keep warm in the cold weather! 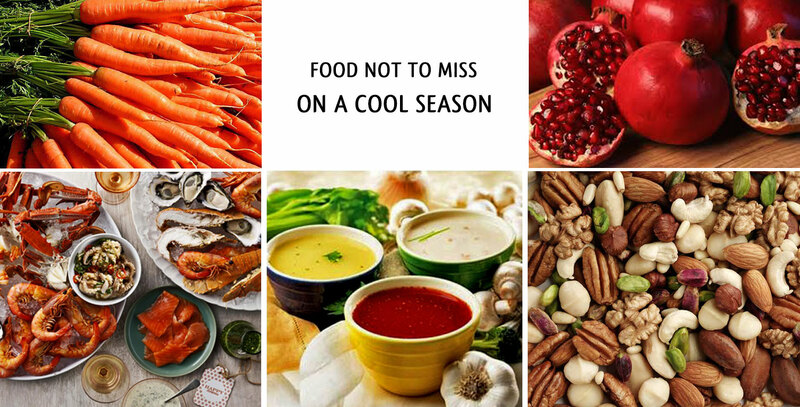 The local delicacies which are also warm in nature, are at their best through October till February. Shellfish like oysters are firm and salty in flavor; crabs are meatier; and lobsters are oh-so-flavorful. So if you are feeling the winter-blues, there’s nothing better that can uplift your food-mood than a hot crisp fish on your plate! This is the time of the year to go fancy all sort of ways with your soup! A comfort food that not only keeps you warm but also keeps your throat clear while being gentle on your stomach. Cream of chicken, vegetable, hot and sour, or perhaps the classic chicken corn soup are some of the favorites. Chilly winds are the reason to explore and experience all the different variety. So what are you waiting for? Grab a bowl of one of these and indulge! « Housemaid: An Asset or An Excuse?